The Goldbergs is a family friendly comedy set in the 1980s. The show focuses on a traditional nuclear family with three children. There are two teenage boys and a girl set in the middle. The father, Murray, played by Jeff Garlin works at a furniture store and lounges in his beloved lazy boy while at home. The mother, Beverly, is often overbearing and constantly interfering in her children's lives; as many of us swear our own mothers were. George Segal plays the aging grandfather. The stories are told from the point of view of the youngest child, Adam, who can be considered a geek and is devoted to much of the pop culture that we remember from the 1980s. For example he has a replica of Castle Grayskull in his room and a Star Wars poster on his door. His sister, Erica, does not have the huge bangs that were popular in the 1980s, but she does often sport leggings and the high ponytail. The oldest child, Barry, is devoted to all of the sports trends that were popular at the time. Lainey moves back to town and Barry invites her to the prom, but when she says no, he plans a prank with Principal Ball's car to get out of going. Erica's decision about her future annoys Murray. Adam tries to start a Mel Brooks club after he sees the movie Spaceballs. When Beverly and Pops come to parents' weekend at college, Erica plans to tell them about an important decision she has made. Barry gets the chance to throw the first pitch at a Phillies baseball game and believes this represents his opportunity to play professionally. Erica makes an important decision about her future. Beverly takes up dancing with her friends but is dejected when her family are unimpressed by her intention to perform in a recital. Adam attempts to act cooler than Emmy's handsome new date. Hoping to enjoy a genuine spring break experience, Erica and Barry visit Pops in Florida, but the jaunt isn't what they expected. Adam's truthfulness gets a surprising reaction from his parents. Barry enlists his friends' help to break up Beverly's social group in order to get more of her attention, but big arguments ensue. Adam's attempts to trick Murray into loving the theatre backfire. Worried about her soon-to-be empty nest, Beverly replaces her children with the Mellors, nursing Coach Mellor back to health after an injury. Erica and her college roommate get on each other's nerves. Adam writes an original script about Indiana Jones, but his passion for directing is challenged when he films it. Barry bets Murray that he knows where to find the best cheesesteak sandwich ever. Adam and Murray argue over Adam's plans to pursue a comedy career after his act in woodwork class nearly results in his teacher getting injured. And is college turning Erica into a pretentious snob? Erica is appalled when Geoff arranges for them to go out to a restaurant with her family to celebrate her birthday. But Geoff soon discovers that dinner with the Goldbergs is no ordinary meal. Beverly seeks her children's advice on assembling a circle of friends for her later years. Geoff's romantic gestures begin to annoy Erica, and things go awry when she tries to reciprocate. Erica tells Beverly she is spending the first night of Hanukkah with Geoff and his family, so Beverly starts a competition over who hosts the best Hanukkah party. Pops advises Barry on how to be cool. Adam and Barry write a song but don't get the reaction they were expecting from Murray. Beverly keeps calling Erica at college but Erica wants some space from her mother and screens her phone calls. When Murray insists a reluctant Adam must have driving lessons, the family learn something new about Pops in the process. Barry visits Erica for the weekend and thrives on the college social scene. Marvin reveals he has become a stockbroker and convinces Barry and his friends to invest money with him, forcing Murray to intervene. Beverly invites 50 people over for a Thanksgiving 'potluck' meal. Murray's furniture shop faces competition from a rival with an attention-grabbing advertising campaign. When Barry's attempts to court a girl at school end in failure, Beverly steps in with advice. Adam and Jackie fall out over which Halloween costumes to wear, so Murray teaches Adam his strategy for peaceful relationships. Barry plots to be reunited with Lainey when she visits Erica at college. As the school year comes to a close, Barry and Erica wonder what they'll be voted for in the yearbook and pressure Adam—who's on staff—to see the rough layout before it goes to print. But when they accidentally delete it, mass panic ensues and messes up Adam's relationship with Jackie. Meanwhile, Murray is annoyed when Marvin comes to visit for money, but Beverly convinces him to help Marvin out with a plan, because he's family. The TV movie "The Day After" freaks out Barry, who attempts to convince Murray to build an underground bunker. Meanwhile, Erica and Adam try to use over-the-top Mother's Day gifts to get what they want, but it ultimately backfires. Murray is honored as one of Jenkintown's top businessmen, which is how Beverly learns her husband has no discernable hobbies—and her attempts to help him find some backfire. Meanwhile, Barry creates a scheme stealing golf carts, but when the situation goes awry it's up to Erica to save the day. Feeling left out, Barry attempts to create a divide between Adam and Pops' relationship, as they debate the merits of the recently released Batman movie. Meanwhile, Erica purposely blows her college interview so she will go to her first choice. Hoping Murray will help as an alumni donor, Beverly and Erica learn a secret about Murray. The Goldberg kids have big plans on prom night, all of which go awry. The night includes Barry's big romantic gestures for Lainey; Erica's attempt to go to prom with Geoff; and Adam being asked out by a nerdy but cute junior. Erica starts to receive acceptance letters from college; at the same time, Barry wonders if he should modify his dream to become a doctor in order to attend the same school as Lainey. Meanwhile, Murray decides that his love for the dog is greater than that for his children since Lucky won't ever leave the nest. Barry feels threatened when school deadhead Matt starts hanging out with the JTP; and Beverly decides to start a family swear jar after she hears Adam use a curse word. An homage to the movie "The Karate Kid" finds Adam preparing to settle his long-standing feud with the other Adam Goldberg once and for all. As part of his training, he and Barry end up cleaning their Uncle Marvin's apartment. Meanwhile, Erica and Geoff take some heat for their new relationship. Beverly is on a mission to transform Adam into a teenage heartthrob after a local kid talent agent insists he's only right for nerd roles. Meanwhile, Barry decides to go punk and Murray attempts to become more involved in Erica's life, but it backfires. Barry and Erica both get jobs working at Spencer's Gifts, but only one Goldberg shines as a star employee. Meanwhile, Murray wants all three of his children gainfully employed, even though Beverly is adamant that Adam focus on his filmmaking. Adam feels like a friendship is on the line as he attempts to channel Andre Agassi when competing with Barry in a tennis match against Chad and Dave Kim. Meanwhile, Erica works through her Valentine's Day blues with help from Beverly. Adam and Barry learn something new about Murray when school is canceled because of snow; and Beverly makes a surprising discovery while giving Erica's college application a read. Episode 11 - O Captain! My Captain! As Beverly's substitute teaching inspires Barry, Adam gets a lesson about the difficulties of being a teenage girl. Adam tries to imitate the Globetrotters on the court after seeing them in action for the first time; and ends up irritating Barry, who challenges his little bro to an epic battle at the school gym. Meanwhile, Beverly ignores Murray's protests by planning him a surprise 50th birthday party. Barry objects when Adam and Lainey are cast as lovers in the school's production of Phantom of the Opera. Beverly makes sure Erica can't coast through her senior year. Adam decides to use Murray's love of action movies to convince his dad to help him make one. But the production goes haywire when a new leading man is needed after Barry goes missing. Meanwhile, Erica goes shopping with Beverly for a new wardrobe. Murray and Pop-Pop wage a war of words after the Goldbergs get their first-ever answering machine. Fed up with their fighting, Erica, Barry and Pops hope to broker a peace using a trip to a hockey game as leverage. Meanwhile, Beverly worries about Adam's social standing after he begins spending his lunch period with some lovable geeks in the computer room. Episode 3 - George! George Glass! Erica and Adam follow the lead of Jan from "The Brady Bunch" when dealing with relationship problems; and Beverly reaches her limit when it comes to dealing with Murray's stubbornness after he causes her to miss the Beach Boys at Live Aid. Erica and Lainey try to find Bill a love match using some new dating technology and Adam's filmmaking skills. But they face some competition from Beverly, who insists on taking an old-fashioned approach to matchmaking. Meanwhile, a failed aptitude test leads Barry to decide to pursue being a gym teacher as Coach Mellor's apprentice. ABC is said to be developing a new sitcom that will propel at least one character from The Goldbergs into a more future-ish version of the past. 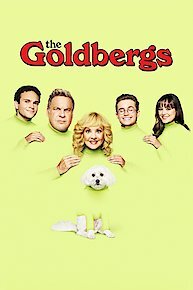 The Goldbergs is currently available to watch free on Tubi TV and stream on Shout Factory. You can also stream, download, buy, rent The Goldbergs on demand at Amazon online.